I really hadn’t planned on doing ‘lettuce trials’ this year. I pretty well proved to myself with my 2010 trial and 2011 trial that lettuce was indeed very hardy when protected by a cold frame. 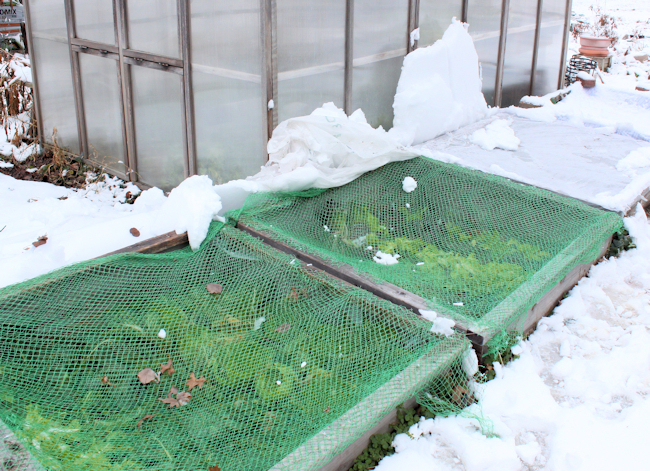 Last year we had so much snow that it trashed the cold frame covers, and pretty much trashed the lettuce underneath it too. So knew that my cold frame design wouldn’t hold up to a heavy wet snow. This year we had an early winter cold snap that brought us unseasonably cold weather and an early December snow. How would the lettuce hold up this year, I wondered? After a couple of weeks, the snow finally began to melt and I could chance a peek inside the cold frames. I planted less lettuce than usual in the cold frames this year, and more spinach. The season for spinach is so short here that it made sense to grow as much as I can. The season for lettuce is a lot longer, and I figured there is less need to try and overwinter it. I peeked in the first cold frame, which was planted with spinach. Everything looked good in there. The second cold frame had a mix of spinach and parsley. When I opened it up, the parsley looked unfazed by the snow and cold, as did the smaller spinach plants. Now for the cold frame with the lettuce and arugula. The lettuce looked pretty much the same as it did before the snow. The three varieties (Simpson Elite, Winter Density and Red Sails) looked good. To be sure, they’re not growing much, but they are alive and well. A closeup of the lettuce shows the condition a little better. So, the plants under the cold frames held up well to the cold and snow. But this past weekend we received 4.25 inches of rain in one day. The main vegetable garden is downhill from the house and is on sloping ground that is prone to erosion. I could see that a small gulley had washed out in the row where garlic is planted. The ground is way too wet to walk in there at the moment, so I zoomed in with the camera lens while standing on the outside of the garden. It looks like most of the garlic is hanging on. It’s possible a few plants got washed away, but I won’t know for sure until the soil dries enough for me to get in there. I will have to repair the gulley and cover up the garlic that is exposed. Hopefully the garlic will not mind being exposed for a few days. Oh well, there’s nothing to be done about it anyway for the time being. So that’s my report on the hardiness of lettuce here in 2013. Our temperatures got down below 10°F on several nights, but with the protection of the snow covered cold frames the lettuce survived just fine. Which proves once again that lettuce can take quite a bit of cold weather if protected. This entry was posted in Gardening and tagged cold frame, erosion, lettuce, snow, spinach. Bookmark the permalink. I can’t believe it, you got more rain in one day than we’ve had in our rain year (starts July 1). Hooray for your hardy lettuce, boo hoo for you poor garlic. I hope the garlic pulls through ok.
I’ve had lettuce survive unprotected in my garden. But they were small and self seeded in the path. They never did grow well in the spring though. I think just survival was enough to sap their strength. I have been wanting to try lettuce in my cold frame, but if I put the lid on, does that mean I would need to open it and water regularly? My CF faces east and gets heavy sun most of the day… would hate to fry the tender lettuce plants if they sprout! If the cold frame has a solid plastic or glass top, then it needs to be opened to regulate heat (or have an automatic opener). If you use row cover or other porous material, it doesn’t heat up enough to hurt the plants.